Paddle through Pierce Butler’s old abandoned rice fields and a tidal forest – teaming with wildlife. You will encounter old growth cypress, tupelo, and wildflowers. Guide extraordinaire, Danny Grissette, with Altamaha Coastal Tours will lead the paddle on Saturday, May 11. The adventure begins at 10 am at Skipper’s Fish Camp Restaurant parking lot – just off Hwy 17. 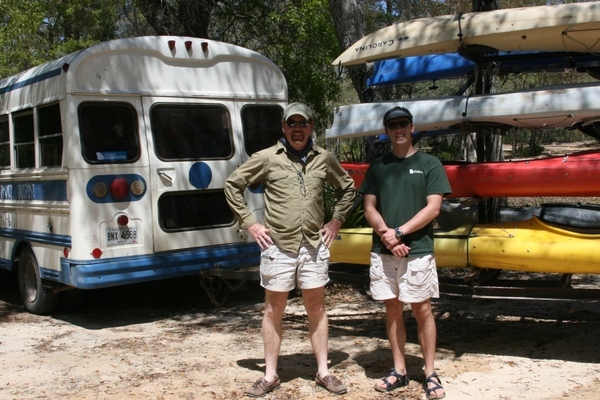 Danny will give a short kayaking lesson before the leisurely 2 ½ hour paddle. The trip, suitable for beginners and children, is offered at a special price of $35 per person. Space is limited. Call Constance at (912) 437-8164 asap or email: cor@altamahariverkeeper.org to reserve your space, a tandem or single kayak, canoe, or bring your own. After the paddle, (approximately 1:00-1:30), Skipper’s has reserved the Oyster Bar deck overlooking the river for our lunch (Dutch Treat). We look forward to having you join us; it’s a chance to meet some new friends, trade paddle stories, and find out what ARK is doing to protect our rivers. Kayaking for the Georgia Coast!! During the first week in November, 2012, four businessmen will dedicate themselves to bringing awareness to the plight of the coast. To do so, they will set out on a 100-mile fundraising kayak trip along the entire Georgia Coast. 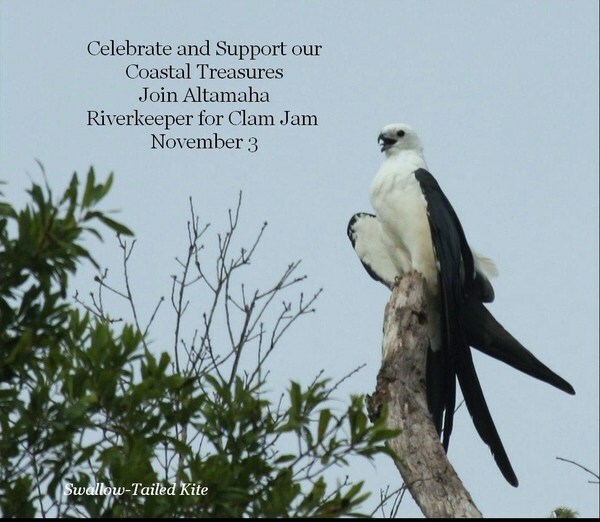 Help support their effort, and bring awareness to the natural treasure that is Georgia’s Coast! Join us and Save Georgia’s Coast! Save Georgia’s Coast is a group of organizations located near the coast of Georgia that have come together to protect our quality of life in coastal Georgia. Our goal is to protect and preserve what makes coastal Georgia so special to those whom call it home. 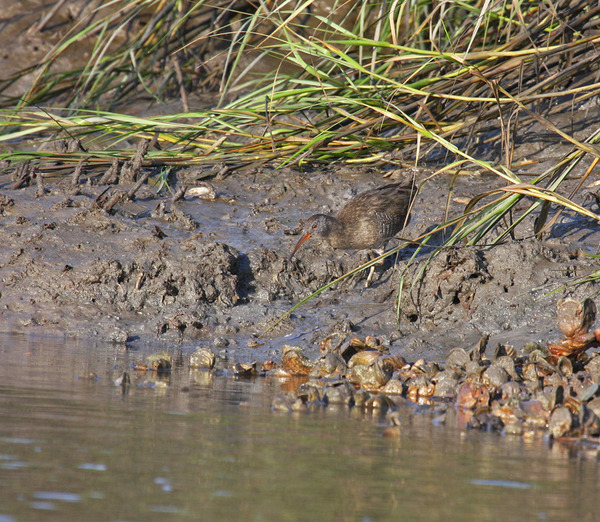 Admired worldwide for their beauty and biological diversity, coastal Georgia’s saltwater marshes, freshwater wetlands, and freshwater flows have been increasingly impacted by the residential and commercial development that has irretrievably damaged so many other communities along the Eastern Seaboard. We are alarmed about unchecked development and water pollution along the coast. We are working so we can continue to drink the water, eat the fish, and safeguard our rivers, marshes, and islands for future generations. We believe a strong economy and our quality of life are dependent upon a healthy environment.Eight non-profit organizations dedicated to the protection and restoration of Georgia’s coast comprise Save Georgia’s Coast. They are the: Altamaha Riverkeeper, Center for a Sustainable Coast, Glynn Environmental Coalition, Ogeechee Riverkeeper, Satilla Riverkeeper, Savannah Riverkeeper, Sierra Club, and Southern Environmental Law Center. All of these groups have years of experience working on the coast, and special qualities that make them critical to the overall success of Save Georgia’s Coast. Click here for Kayaking for the Georgia Coast Challenge! Doug Pettersen, Phillip Hodges, James Marlow and Allen Bradley are teaming up with Save Georgia’s Coast to bring further awareness to a subject that they each feel very passionately about: The fragile state of our Georgia Coast.During the first week in November, 2012 they will set out on a 100-mile fundraising kayak trip along the entire Georgia Coast. They will start the journey in Hilton Head, South Carolina, and will travel south along the Georgia Coast, winding their way through Georgia’s beautiful saltwater marshlands, past Tybee Island and Jekyll Island State Park, continuing on past Cumberland Island, which will then lead them to their final destination of Amelia Island, Florida.They are taking this tremendous opportunity not only to bring awareness to others concerning the continuous pollution and detrimental alterations being made to our Georgia Coast, but to also improve the future of Georgia’s marshlands and wetlands.Your sponsorship in support of their journey will allow Save Georgia’s Coast to continue in their ongoing efforts to protect and preserve Georgia’s coastal waterways, marshlands, and wetlands. Please make a pledge and support “Kayaking for the Georgia Coast” today! About Doug: Doug Pettersen developed a love for the outdoors through his climbing and mountaineering activities. In that regard, he worked for many years as a professional guide for rock climbing and mountain climbing expeditions. Currently, Doug serves as a technical consultant to locate and operate video equipment at international athletic events. Doug views the kayak trip both as an opportunity to explore Georgia’s coast and to support environmental efforts on the Georgia coast. About Phillip: Phillip Hodges is a partner with Ernst & Young LLP in Atlanta. Phillip and his family reside in the suburbs of Atlanta with close access to the Chattahoochee River. As a native of rural North Georgia, his love for the outdoors and mountains started at an early age, and canoeing, kayaking and hiking are in his blood. Coastal navigation and shucking oysters are new games to him. Phillip is a graduate of the University of Georgia, is a member of the Upper Chattahoochee Riverkeeper, and is on the Advisory Board of ImagineIt! The Children’s Museum of Atlanta. About Allen: An avid outdoorsman, whenever Allen is not handling complex corporate legal matters as a member of the law firm of Stites & Harbinson,PLLC, he is spending time with his wife and three children traveling across the country on wilderness camping and canoe trips or hiking the Appalachian Trial. However, his passion for the environment doesn’t stop once he steps into the office. As a Board Member of the Georgia Solar Energy Association, his dedication to renewable energy and environmentally friendly alternative fuel sources is reflected in both his work and his outdoor activities. About James: James Marlow is CEO of Radiance Solar and an avid paddler, sailor and conservationist. He is a member of the Advisory Board for the Savannah Riverkeeper and the Million Mile Greenway as well as a member of the Georgia Solar Energy Industry Association, and the Technology Association of Georgia Smart Energy Board of Directors. He is a graduate of Georgia Southern University. 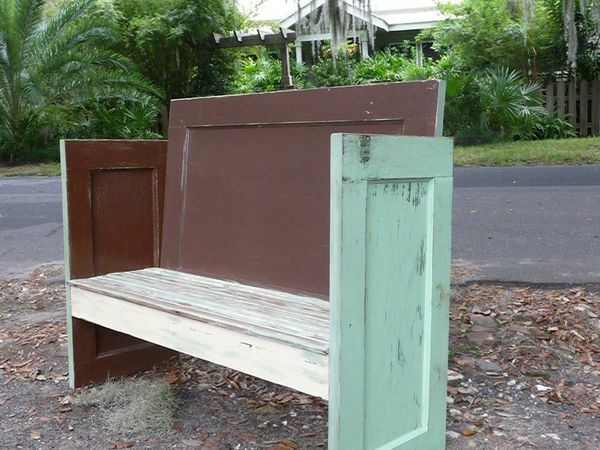 Handmade Rustic Bench made from vintage doors. One of many fantastic Clam Jam auction items. Call your friends and bring a crowd! Join ARK for the Clam Jam and an opportunity to win the Cuda, a state-of-the-art kayak! Please join us to celebrate our coast with an alfresco dinner of fresh shrimp, oysters, and clams and music by Courson Saunds and Nick Bryant. • Guided historic canoe trip, lunch, and refreshments for 6 of some of the most pristine parts of the Oconee River. The approximate 10 mile tour is guided by ARK board member, DuBose Porter and narrated by local historian, Scott Thompson. Donated by DuBose Porter. • A day of exploration and lunch for 8 on St Catherine’s – an undeveloped barrier island preserved for scientific, archeological, and conservation research. • Private reading for the winner and friends by Janisse Ray of her newly released book, The Seed Underground; A Growing Revolution to Save Food. • A private island adventure and 2 night stay on Little St Simons, 10,000 acres of maritime forests and marshlands and seven miles of shell-strewn beaches. Accessible only by boat, this extraordinary natural sanctuary is among the last of its kind. • Amphibians and Reptiles of Georgia by John Jenson, et al. • “Wild Horses on Cumberland” a beautifully framed and signed black and white photograph by Jeffery Williams of Williams Gallery in Savannah. 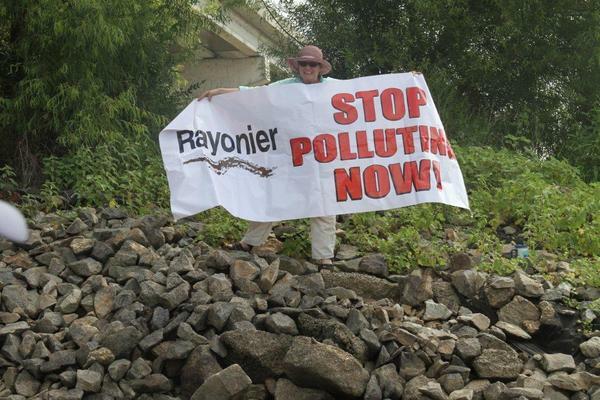 Please join the Altamaha Riverkeeper’s efforts to get Jesup’s Rayonier pulp mill to clean up its pollution of the mighty Altamaha by viewing and sharing their new video production. Click into You Tube here: http://youtu.be/yAWNI1hknPo to see the video and pass it on to your friends. Special thanks to Judy Sharpton for her ballad “Uncle Toad’s Question” and to Donata Renfrow of J. Galt and Associates for producing the video. They need your help to get this out, so please take a few minutes today to view the video and share it where ever you can. You can also view the video on ARK’s website at www.altamahariverkeeper.org. Please get involved and support ARK’s work to secure stricter permit limits for Rayonier’s discharge.